I AM 26 and come from a family of eight, which includes my parents, four sisters, a brother and myself. I was born and raised a Catholic in Samoa. When I was born in 1990, my father Etuale Luamanu and mother Saifuiono Luamanu were on their last year of theological studies as acolytes in the Archdiocese of Samoa. They have been involved in active ministry ever since. In 2009, my father was ordained a permanent deacon. My father is a musician and taught my family well. We are all singers and my younger brother and I play the piano. My school years were varied because every five years in Samoa, the Church ministries shift around parishes according to the archbishop. In 2009, I was started studying for my Bachelor of Commerce degree at the Samoan National University. At the same time, the Archbishop of Montego Bay Diocese from Jamaica visited Samoa and was overwhelmed by the faith development of the Samoans. He admired the way we worshipped and requested that some musicians come to work in his archdiocese in Jamaica. At this point my family was assigned by our Samoan archbishop to move to Montego Bay as missionaries. This three-year experience in Jamaica had a profound influence on me. I began to spend more quality time with Jesus in private prayers and by the time I returned to Samoa in 2012, I was a changed person. I went back to university resuming my studies for the next two years and completing my degree. At this stage I felt like I was going through the motions. I attended my course and sat the exams just for sake of doing them. For the two years that I was back in Samoa, I was still thinking of Jamaica and my parishioners, schoolmates, youth groups and all the people that my family and I had being working with in the Church. In 2014, I was in the last year of my bachelor degree when I got my first job in a bank working in international trade and finance. This had been my goal since I was a young kid and I thought I would be super excited at the thought of becoming a wealthy businessman. However, the truth was this did not interest me anymore. I knew what changes of feelings and desires I had, and it became very clear to me what I needed to do. Without telling my parents or any members of my family, I applied to join the seminary of Samoa. After two weeks, the vicar general called me and told me that I had been recommended to the archbishop to pursue my studies in the seminary the following year. One evening after dinner I told my parents my BIG news. I could tell by their emotional reactions that they were not surprised at all. My mother mentioned that God has answered my maternal grandfather’s last wish that I would become a priest. My grandfather is one of the many reasons that I am here today discerning God’s call. In our village in Samoa, there is no Catholic Church. My grandfather married a Mormon from the village. She converted and each week they travelled to the closest Catholic parish to attend Mass. They had six children of which my mother is the oldest. Until a few years ago, my whole extended family on my grandfather’s side every week would pack two or three vehicles and drive to the edge of the island for Mass. He is the reason there is a such strong Catholic faith in the village. I believe the faith of my grandfather in the Catholic Church is also the inspiration for my uncle’s conversion from being a Mormon to becoming a Catholic priest for the Archdiocese of Samoa. A few weeks after the vicar general’s phone call, the Samoan archbishop visited our parish and asked my parents if he could talk to me in person. He suggested that I finish my business studies and graduate before joining the seminary. I did not tell him I wasn’t interested in doing any further academic studies in the business sector and that I just wanted to become a priest, moreover that I wanted to join the seminary as soon as possible. So I put my trust in Jesus and was confident that the Holy Spirit was working through the archbishop. I obeyed and held off joining the seminary in Samoa. 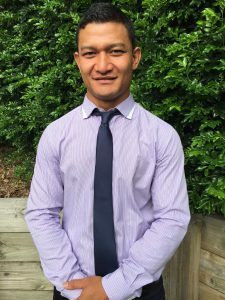 A few months later at work, the Samoan Immigration Office offered me a chance to move to New Zealand to work there permanently. I took the opportunity, moved to Auckland the following year and continued working. While there I would go to church every week and prayed to God about many things, including whether it was his true will for me to come and live in New Zealand with a different culture and environment, or whether he was calling me to become a priest. I tried to catch the vocations program every month but couldn’t do so because work was too busy. I even found it difficult to become involved in a parish because of my work. I then decided to move to Australia where I have an uncle who is a priest. I was keen to seek his advice because at this point I was still searching for my calling. I did some well-paid labouring work, while experiencing Canberra for a year. I became involved with a parish, joined the music ministry and found myself being able to attend vocation programs such as Man Overboard. This final year of discernment in Canberra led me to join the seminary. And here I am here today studying for the Archdiocese at the Good Shepherd Seminary in Sydney. I believe that God is guiding me and leading me to become a priest, and I feel that every plan Jesus has been setting for me is falling into place. As I start this journey to priesthood, I pray he will help me to open my heart and listen to the guidance of the Holy Spirit so that I may find myself closer to God and discover my true calling.